Church Street is one of the main east-west streets in Downtown Buffalo, connecting to Main Street to what is now the Interstate-190. The street was originally laid out by Joseph Ellicott and was named Stadnitski after Pieter Stadnitski, a Dutch banker and one of the agents of the Holland Land Company. The street was renamed in honor of St. Paul’s Episcopal, St. Joseph’s Roman Catholic and First Presbyterian Churches. 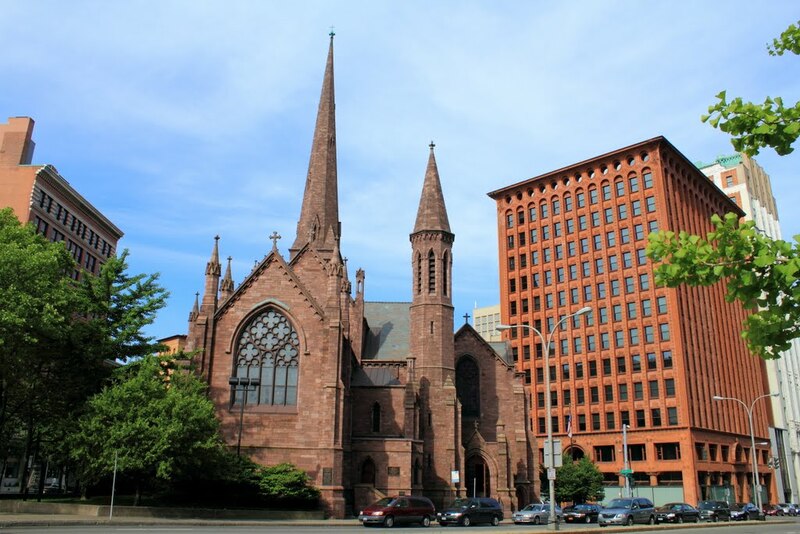 The Downtown Buffalo core used to be home to other churches, but many moved uptown as their congregants moved out of downtown towards “suburbs”, such as the case with First Presbyterian Church or Lafayette Presbyterian Church. 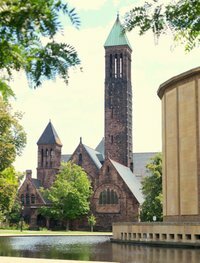 St. Paul’s Episcopal Cathedral is the cathedral of the Episcopal Diocese of Western New York. The congregation started in 1820, and their first church was built on land donated by Joseph Ellicott, at the corner of Main and Erie Streets. 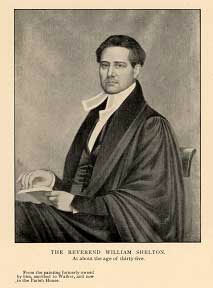 Reverend William Shelton came to the church in September 1829 and served as Rector until 1881. The congregation started to grow significantly following the opening of the Erie Canal. The current church opened (on the site of the old church) in 1851, on Shelton Square. The church was designed by Richard Upjohn, who is considered one of the greatest American Gothic church designers. The congregation wanted the church to be made out of limestone; however, they could not afford the limestone. Upjohn instead used Medina sandstone. On May 10, 1888, the church was almost destroyed following an explosion and fire. All that remained was the walls. The church was rebuilt according to Upjohn’s original plans and reopened in 1890. St. Paul’s was listed on the National Register of Historic Places in 1973 and was named a National Historic Landmark in 1987. Shelton Square was named after Reverend William Shelton in 1897. Shelton Square was a public space within Joseph Ellicott’s original street layout for Buffalo, at the intersection of Erie, Church, Main and Niagara, North Division and South Division Streets. The area was where Joseph Ellicott originally planned to build his house. He later donated land at Shelton Square to the churches. In the 1950s, Shelton Square was considered Buffalo’s “Piccadilly Circus”. A trolley/bus shelter was located in the middle of the square, and this served as the main hub for the entire city – serving the International Railway Company and then the Niagara Frontier Transit system. Shelton Square disappeared during the 1970s, when a portion of Shelton Square was covered by the Main Place Mall, and Erie street was replaced by Cathedral Park. St. Joseph’s Roman Catholic Cathedral is located at 50 Franklin Street. The church serves as the cathedral church for the Buffalo Diocese. Buffalo’s first Bishop, John Timon, established St. Joseph’s in 1847. The cathedral was dedicated in 1855 and was consecrated in 1863. The original plans for the cathedral called for two towers at the north and south ends of the facade, but only the south tower was built. The tower contained a 43 bell carillon (a musical instrument consisting of bells, typically found in church towers or municipal buildings). At the time of installation in 1869, the carillon was the largest in America and the third largest in the world. The bells were too large for the tower and never worked properly, so all but two were removed from the church. 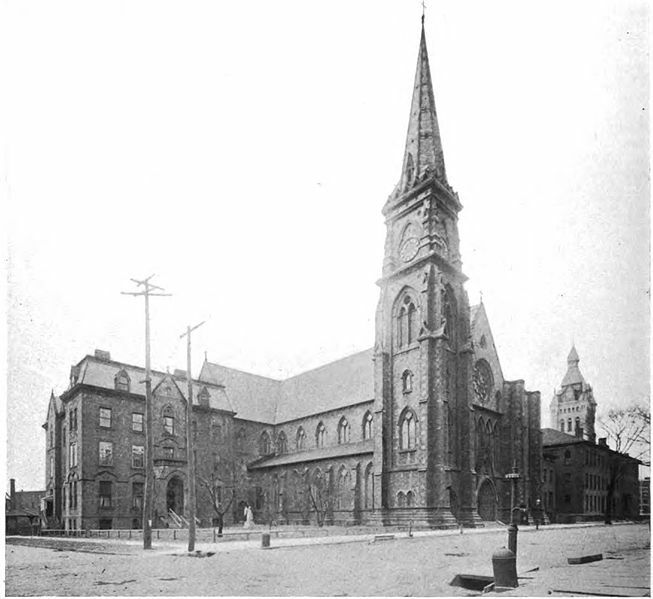 In 1902, the Buffalo Diocese determined that a new cathedral was necessary, so property was purchased at Delaware Avenue and West Utica Street. The New St. Joseph Cathedral opened in 1915, and St. Joseph’s downtown was known as “St. Joseph’s Old Cathedral”. 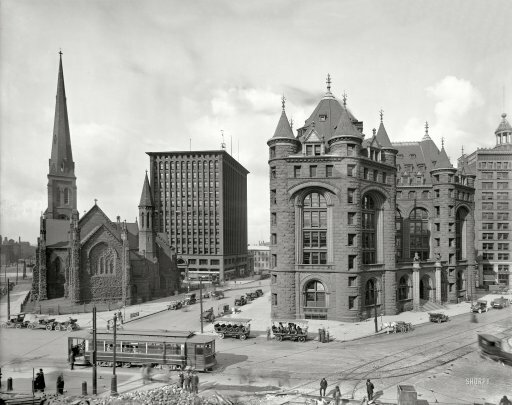 The new cathedral was not built for Buffalo’s climate and major repairs had to be made as soon as 1924. The exterior marble started to fall off and in 1976, the Bishop decided repairs would be too costly. In 1977, after demolition of the new cathedral, the “old cathedral” reverted to its former name of St. Joseph’s Cathedral. The third of the churches was First Presbyterian Church. When First Presbyterian Church was organized on February 2, 1812, it was the first organized religious body formed in Western New York. 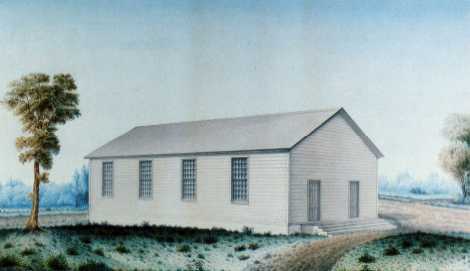 The first building for the church was built at the corner of Pearl Street and Niagara Street. The church opened in 1824 and was used by the church until 1827. 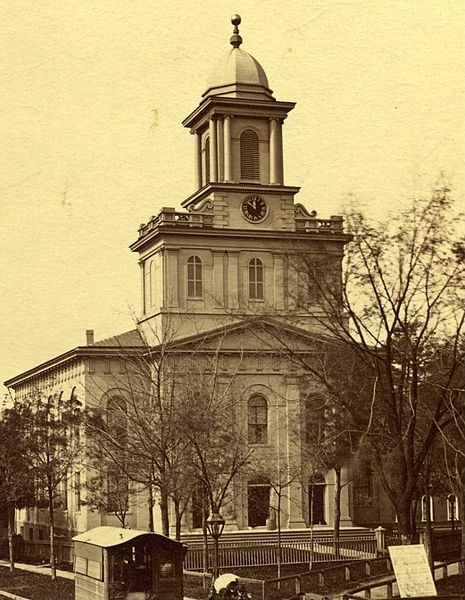 As the congregation grew, the building was sold to another congregation in 1828 and moved to the corner of Genesee and Hickory Streets, and was later moved to Walnut Street in 1878. The building saw many uses over the years – a school-house, a tenement, a cooper’s shop and an icehouse for a brewery. It was destroyed by a fire in 1882. No pictures of the building are known to exist. First Presbyterian’s “Brick Church” was dedicated in March 1827. With seating for 800, it was the largest church west of the Genesee River. The church’s bell was referred to as the “town clock bell” and served all of Buffalo as a fire alarm. When sounding alarm for a fire in 1833, the bell cracked, but was quickly recast and served the church until the church was razed. The bell was then presented to a church in North Tonawanda. 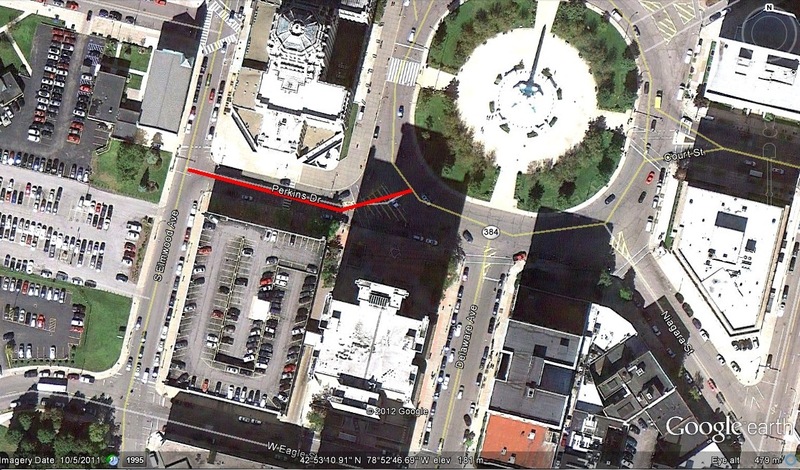 As the congregation grew, members also moved away from the central part of the City of Buffalo. At the time of founding, most of the congregation lived near the church, but as the central business district developed, many had moved uptown and found congregations closer to their homes. The church was at risk of closing. Many members of the congregation were against moving the church, so the matter had to be taken up with the Presbytery and was taken to court. The matter was resolved in favor of moving. 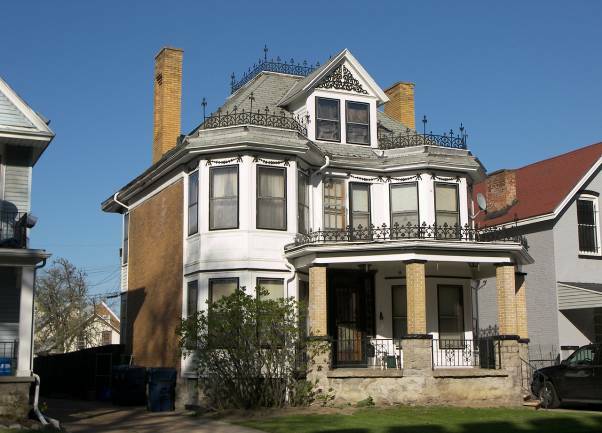 In 1887, Mrs. Truman Avery, who lived where Kleinhans Music Hall is now located, donated a parcel of land across the circle, at the corner of Wadsworth and Pennsylvania Streets. In April 1889, the congregation was ordered by the city to sell the property to Erie County Savings Bank to make way for the bank’s new office. (the bank was located at Shelton Square until the 1970s, when it was demolished for construction of the Main Place Mall). The Catholic Church in the United States of America: Undertaken to Celebrate the Golden Jubilee of His Holiness, Pope Pius X. Volume 3. Catholic Editing Company, New York, 1914. DeMille, George. 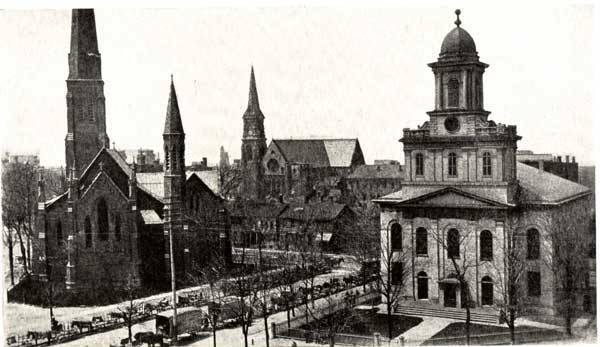 St. Paul’s Cathedral, Buffalo, 1817-1967: A Brief History. This is the third and final part in a series about Joseph Ellicott. Click here to read Part One about Joseph’s family and his early life. Click here to read Part Two, about Joseph’s days with the Holland Land Company. Today, I am going to touch on Joseph’s legacy throughout Western New York. 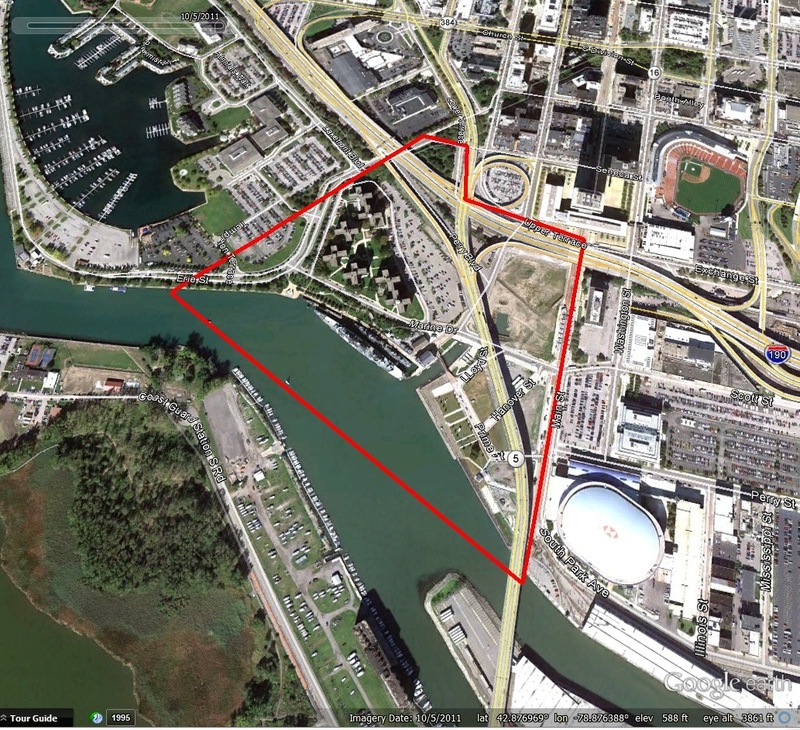 Mindful of Buffalo’s strategic location as a port, Joseph Ellicott was a strong advocate for a canal to be built from the Hudson River to Lake Erie. He served as one of the first Erie Canal Commissioners and was appointed in 1816 to supervise the canal construction. He was also responsible for convincing Governor Clinton not to send to England for engineers to design the canal, but to use local talent instead. He donated more than 100,000 acres of company land for the canal project. He resigned from the Canal in 1818, due to his declining health. Joseph worked hard to further the settlement of Buffalo by encouraging development on certain transects. As hard as Joseph worked, his later years were not as bright. He suffered from physical and mental health issues in his later days. As early as 1816 he began to suffer from periods of depression and melancholy. At the time, his condition was thought to have been brought upon by his lonely, unmarried life as well as the disappointments of the unrealized hopes and dreams. In 1821, the Holland Land Company suggested that he was no longer needed and Joseph retired. He became a hypochondriac and was admitted to Bloomingdale Asylum in New York City by his family around 1824. He died in 1826 by hanging himself. 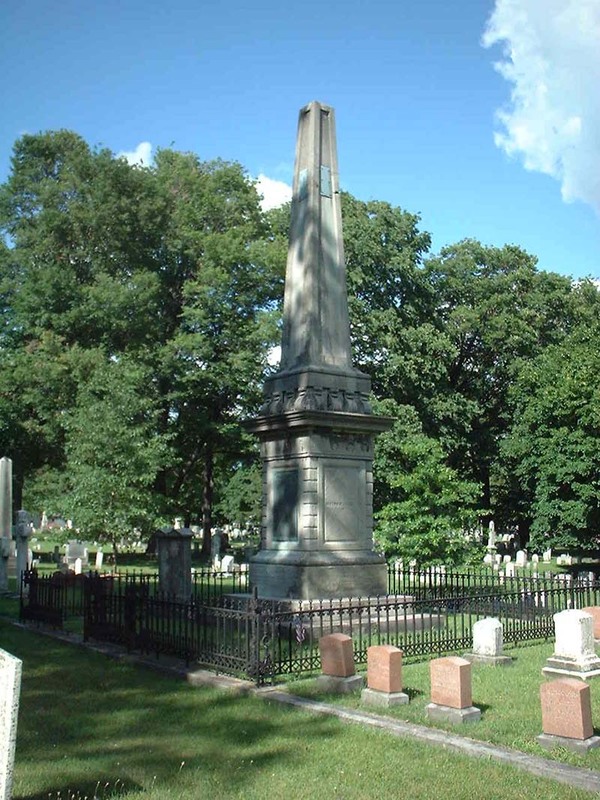 He was originally buried in New York City, but was exhumed and reburied in Batavia in the Batavia Cemetery. Ellicott Square Building – A ten story office building in Downtown Buffalo. When it was built in 1896, it was the largest office building in the world. The building was designed by Charles Atwood of Daniel Burnham & Company Architects. The building sits on the lot that Joseph Ellicott originally owned. If you look closely at Joseph’s plan from 1804 (click on the picture for a better view), you will notice that some of the streets have different names. Joseph named the streets after the dutch investors and members of the Holland Land Company. In March 1836, Crow Street became Exchange Street. In the end, Seneca, Swan, Chippewa, Huron, Eagle and Delaware were the only street names given by Joseph Ellicott that remained. The Highway Commissioners must have felt a twinge of regret, because the changed the name of Oneida Street to Ellicott Street, honoring the man who laid out our streets and helped the fledgling Village of Buffalo Creek become the City of Buffalo. To learn about how other streets got their name, check out the Street Index. If you want to be the first to know about new blog posts, subscribe to the blog and updates will be emailed to you. And as always, if you have any questions about specific streets, leave them in the comments and I can see what I can do to add them to my queue. Beers, F.W. ”Our County and It’s People: A Descriptive Work on Genesee County, New York.” J.W. Vose & Co Publishers, Syracuse NY 1890. Burns, Rosamond. ”Paving the Way For Settlers: The Rise and Fall of the Holland Land Co.” Buffalo News, January 25, 2004. Houghton, Frederick. ”History of the Buffalo Creek Reservation”. Buffalo Historical Society Publications, Volume 24: Buffalo, 1920. The Man Who First Named Our Streets – Joseph Ellicott, Part One. Ellicott Street is one of the main north-south thoroughfares in Downtown Buffalo. As most people know, the street was named for Joseph Ellicott, the surveyor of the Holland Land Company who laid out the City of Buffalo. Since Ellicott was such a prominent man, instead of making this post too long, I have decided to break it up into three posts. Part 1 today is about Joseph’s early life. Part 2 details Joseph’s work with the Holland Land Company. Part 3 discusses Ellicott’s legacy. 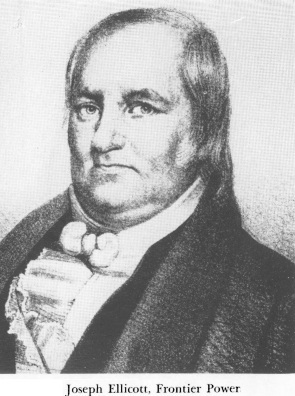 Joseph Ellicott’s father, Joseph Ellicott, Sr. was founder of Ellicott’s Mills, Maryland in 1772 when he and his brothers set up a milling business there. The elder Joseph Ellicott was instrumental in the farming of the area, by convincing the farmers to plant wheat instead of tobacco. The farms flourished because he introduced fertilizer (using ground plaster of paris) to the area to help the depleted soil be revitalized. After the Revolutionary War, they were growing enough wheat to build a mills and the town grew up around the mills. Joseph Ellicott the elder had nine children. Two of his sons, Andrew and Joseph Junior became surveyors. Andrew Ellicott was born in 1754. In 1784, Andrew was appointed to be a member of the survey group working to extend the survey of the Mason-Dixon line. He also surveyed the “Ellicott Line” in 1786. This is the line running north-south that forms the western boundary of Pennsylvania. During his work, he met Benjamin Franklin. Based on Franklin’s recommendations, Andrew was appointed by George Washington to survey the lands between Lake Erie and Pennsylvania to determine the border between Western New York and U.S. Territory. He also made the first topographical study of the Niagara River. In 1791, Thomas Jefferson (then Secretary of State) selected Andrew to survey the boundaries of the Territory of Columbia, which became the District of Columbia (Washington, DC) in 1801. During this time, he surveyed the future city of Washington, working with Pierre L’Enfant. When L’Enfant disagreed with some of the commissioners, L’Enfant stepped down and Andrew took over the planning and revised the plans. Andrew Ellicott’s plans, printed in 1792 were the first Washington city plans to receive wide circulation. In 1794, Andrew plotted the road from Reading, PA to Presque Isle on Lake Erie. 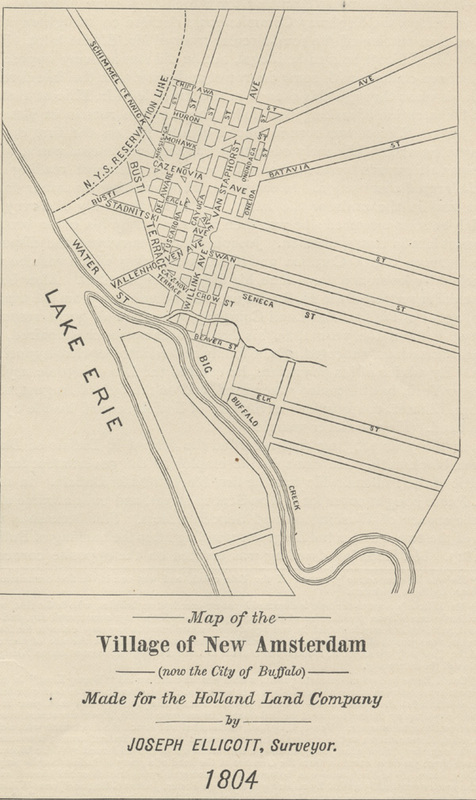 He then laid out the City of Erie, PA and supervised the construction of Fort Erie. In 1796, George Washington again commissioned Andrew for the commission to survey the border between the Spanish Territories in Florida and the United States. He traveled via the Ohio and Mississippi Rivers. He worked for four years on this survey and presented his final report to the government in 1800. However, political administrations had changed and the Adams administration refused to pay Andrew for the work done on the survey. He sold many of his possessions to support his family during this time. When President Thomas Jefferson offered him the post of Surveyor General, Andrew turned it down due to his negative experience with the Adams administration. Andrew’s brother, Joseph was born in 1760 in Bucks County, PA. During Andrew’s survey of Washington, D.C., Joseph was Andrew’s chief assistant. Following the survey of Washington, Joseph went to Georgia to survey the boundary line between Georgia and Carolina. Following that survey, he returned to Pennsylvania, where he met up the Holland Land Company. 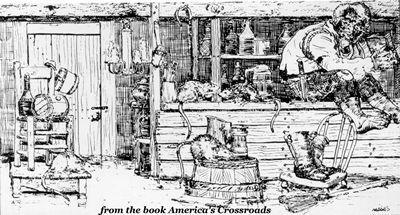 For more on Joseph’s days with the Holland Land Company, click here to read Part Two…. Which Side of the Skyway Debate Do You Fall On? The Buffalo Skyway was originally known as “High Level Bridge”, a description of the function of getting the road over the Buffalo River. The bridge opened in 1955 and was a marvel of modern engineering. The bridge is fraught with controversy today, as many people see the skyway as a barrier to development of the waterfront. The bridge eliminated the waits for railroad and lift bridges that plagued commutes between downtown Buffalo and South Buffalo/Lackawanna. 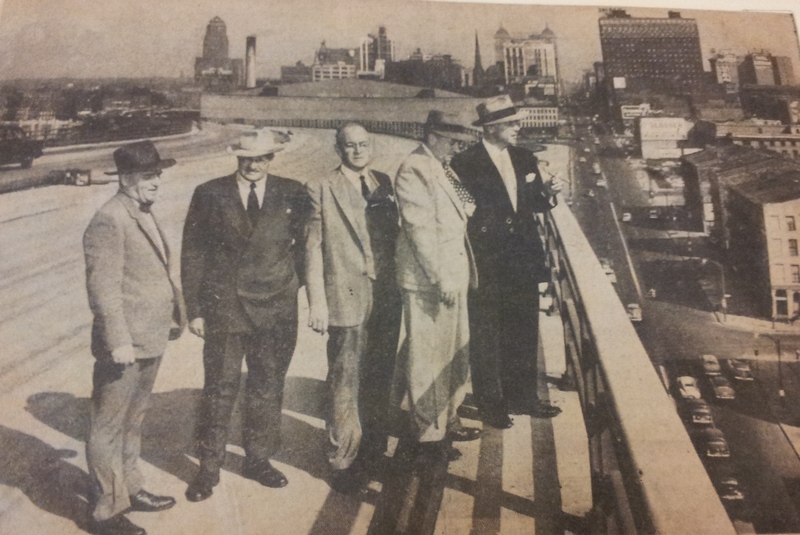 Plans for a bridge had been discussed amongst the Planning Commission as early as 1922. Some early traffic planners had fought for a tunnel instead. The tunnel idea was scrapped because the City would have been responsible for operation and maintenance costs for lighting, ventilating and other maintenance, which the City could not afford. New York State is responsible for maintenance of the Bridge. Some planners insisted that construction of either the bridge or a tunnel would be too expensive and not worthwhile. The Skyway was built despite the fierce opposition and bitter criticism. It was heralded as a triumph of development and engineering. The highest piece of the bridge sits 120 feet above the River. And the viaduct is 5,803 feet in length. The Steel used to create the skyway was from the Bethlehem Steel plant, just down the road. The girders were brought to the River via barge. The Father Baker Bridge, further down the river, was built in similar fashion to cross the Union Slip Canal and opened in November the following year The two plate girder spans measure 348 feet and at the time were the second longest on any structure in the United States (not sure if they still are). The bridge was built by the Bates and Rogers Construction Corporation. Approximately 10,000 cubic yards of concrete was used. It is supported by 15 massive steel “bents”. More than 10,000 gallons of paint were used to protect it from the weather. The bridge incorporated 11,516 tons of structural steel that was fabricated by Bethlehem Steel. The Street was named The Buffalo Skyway after a contest was held to name the bridge. Mrs. Wallace E. Easter, of Lackawanna, submitted the name “Skyway”. Mrs. Easter received a golden key to the City and $100 for her prize. If you had to name the road, what would you have named it? The Bridge cost $12,000,000 (1955 dollars) and Opened on Oct 19, 1955. The Ribbon Cutting Ceremony was held on October 19th and consisted of Mayor Pankow accompanying an inspection party of city and state officials on a tour by car and a ribbon cutting at the north abutment near Delaware and Church Street. A reception was held following the ceremony at the Hotel Lafayette, which included an address by State Public Works Superintendent John W. Johnson. 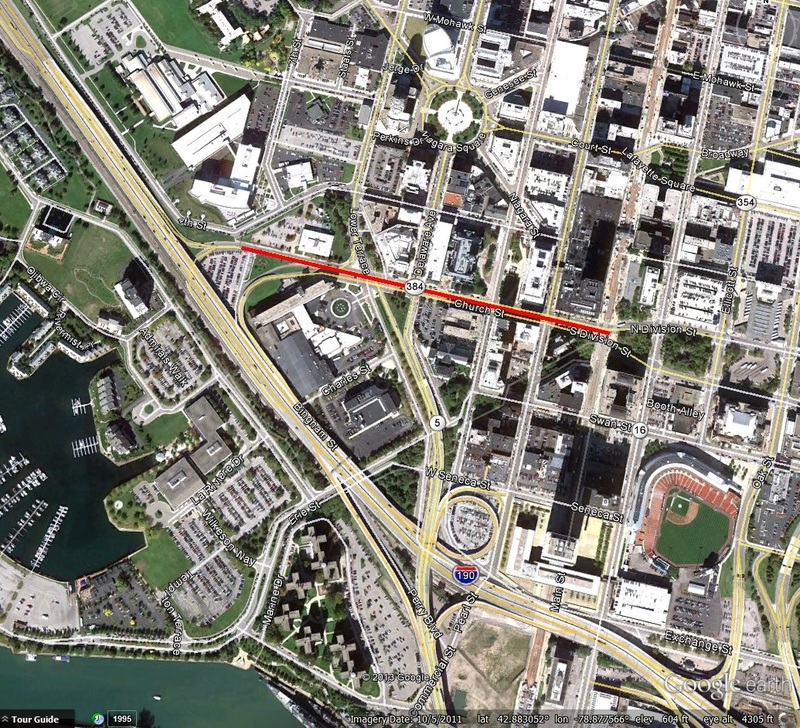 Scajaquada Creek Expressway – $10,000,000. 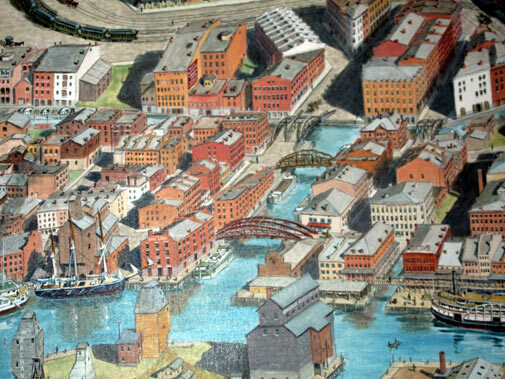 These investments brought the City of Buffalo into a new time period. A time where the car was king. The state officials at the reception called the opening of the Skyway “so magnificent as to be unforgettable”. Today, many people consider the Skyway to be a barrier to development of our waterfront. 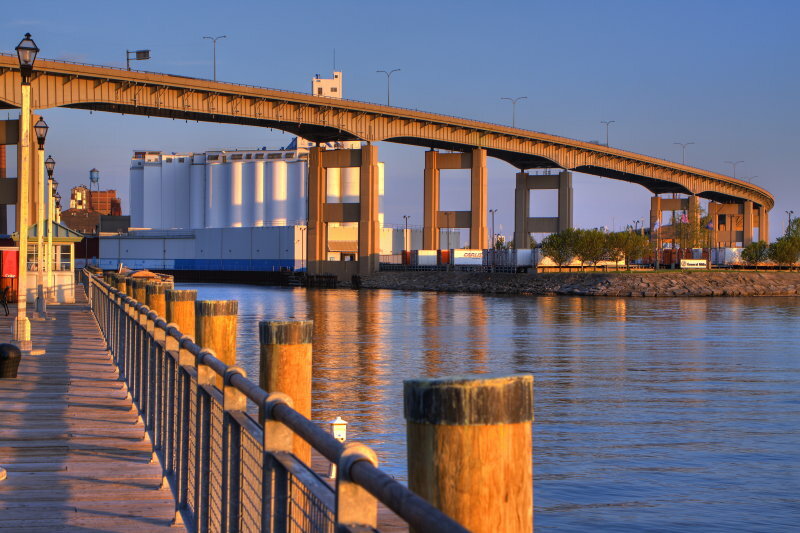 Many public meetings regarding the waterfront, canalside, and other projects result in cries to remove the Skyway. However, from a traffic perspective, it’s one of the best ways to move traffic. It’s a key transportation artery in the City of Buffalo, carrying an average of 38,800 vehicles each day (according to 2011 data from GBNRTC). The New York State Department of Transportation see the Skyway as “a safe, efficient sturdy roadway with another 40,50 years of life in it”. Yesterday, a new article was published in Next American City which quotes the Congress for the New Urbanism stance that the Skyway as one of the top 12 roads that need to be removed. Many argue that the accidents on the Skyway is a reason for its removal. However, the rate of accidents on the Skyway is 0.61 accidents per mile, far below the statewide average for urban, divided four-lane highways, which is 1.52. Some see the Skyway, with its smooth curves as graceful, while at the same time monumental and graceful. The ride along the Skyway is unlike any other drive in Buffalo – these people see the climb, the descent, and the view as phenomenal. So which side of the Skyway Debate do you fall on?